Palladium has been on fire in recent weeks. Bullish momentum has driven up the Nymex March futures contract nearly 20% over the last seven weeks. Now, the market is knocking on the door of important chart resistance at the $704/706 an ounce ceiling, and some analysts see Chinese auto demand as a factor supporting an upside breakout in the days and weeks ahead. Platinum futures have also been in a rising daily uptrend in recent weeks, but Adrian Day, president of Adrian Day Asset Management, pointed to palladium "as a more interesting market" right now. "The Chinese use palladium for catalytic converters in their automobiles. If the Chinese automobile market continues to grow—and I think it will— that will be bullish for palladium," Day explained. Day highlighted comparative automobile figures. "In industrialized nations there is an average of 550-600 cars per 1000 population. In China, the number is 41 cars per 1000 population, they are way behind." However, that does not mean the desire isn't there. Day pointed to a recent McKinsey & Company China survey and he said "households said the number one thing they wanted was an automobile." Bottom line? "There is very, very strong demand for automobiles in China," Day explained. On the supply, side, Day pointed to the Norilsk mine and noted "there was a 4% decline in palladium production in the third quarter. Palladium production is slowing down or going sideways. There is very little potential for palladium supply to significantly increase in the next few years." Barclays metals analysts forecast 2012 total supply at 8,810,000 ounces versus 2012 total demand by end use at 9,770,000 ounces. For 2013, Barclays expects supply at 8,952,000 ounces versus total demand by end use at 9,463,000 ounces. They peg their 2013 palladium forecast at $736. The technical pattern on the weekly continuation chart is potentially even more bullish than that forecast. The market is currently bumping up against the top of a multi-month range. See Figure 1 below. If the market were to post a strong close above weekly resistance in the $720 zone that would confirm a bullish breakout from the sideways range. A measured move target or upside objective can be calculated by measuring the widest point of the range and applying it to the breakout point. A clear upside breakout above that resistance would project a target back to the February 2011 high at $857 at a minimum, based on the measured move pattern. 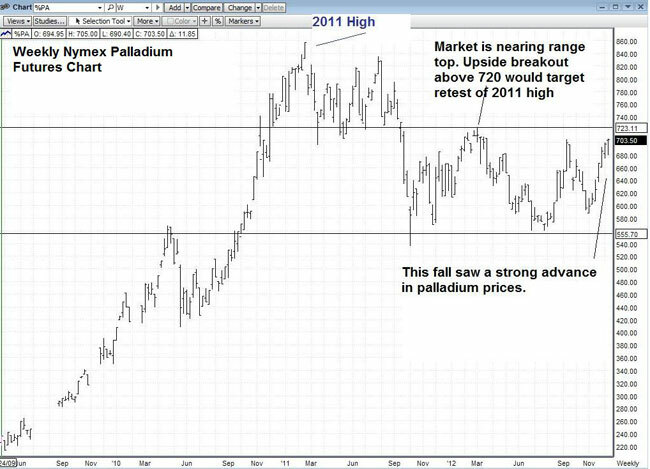 Day saw potential for palladium to retest to the 2011 highs next year. "The best way to buy palladium it to buy the metal—coins or bars, or the ETF (PALL)," he concluded.